Robbie Erlin and the Padres have settled for 1.45M thus avoiding the arbitration process. 2018 was Erlin's first healthy season in some time. He was used out of the pen during the first four months before becoming a full time starter during August and September. He put up mixed results allowing 28 ER in 48.1 IP and going 3-4 over those last two months. 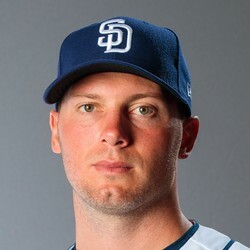 He'll likely slot in as the teams 4th or 5th starter to begin 2019 and with added offensive fire power could be a useful streamer in good matchups.